Who is Mike Harris today, 15 years after the olympics in Nagano? What do you do in your life? Where do you live, where were you born? Nagano really changed my life in many ways. In Canada curling is a very popular sport, so I was instantly recognized after the Olympics. I now am the voice of curling in Canada, working as a commentator for CBC Sports. Sochi will be my 4th Olympic games working as a commentator. I also coach curling in Champery, Switzerland. So I split my time between Toronto, Canada and Champery. I was born just outside of Toronto. When did you first hear of curling? Was curling already the sport of your family? I started curling when I was 9 years old. My parents both curled. I started at a small 2 sheet curling club in Montreal, Canada. When did you start to practice? Have you had different roles inside the team during your curling career (lead/2nd/3rd/skip) or have you played same position all time long? I really began to love curling when I was 11 or 12 years old. I have always been a skip. I really started practicing every day when I was about 16 years old. I would go every day after school and throw rocks for a couple of hours. How well was curling developed in your city/province when you started? Have things changed in time? Has curling become more known and popular? Curling is very popular in Canada. It has been for many many years. Since I began, the Olympic movement certainly has made curling more popular around the world. I would say in Canada, however, curling has remained about as popular as it was before in terms of players, but the television audience is much greater around the Olympic games. You were a part of Canada’s national team at the Olympics in Nagano in 1998. Those Olympic games were special in terms of curling, as curling managed to fight for the spot at the games again… Did you feel special for this reason? None of the curlers of your generation had played at the Olympics before. For our team representing Canada at the Olympics was a big weight taken off of our shoulders. We had come very close to winning some events prior to our Olympic playdowns. So for that reason we were just really happy that we had finally won a big event. We really didn’t understand what we were getting into going to the Olympics. Canadian curlers, before it was an Olympic sport, always hoped to win a Canadian Championship and go to the World Championships… This was our big breakthrough. The Olympics was not the reason any of us started to play back then. I believe it is different now. The Olympics has really captured a new generation of curlers in Canada and elsewhere. What did the path to gain the olympic spot for your team look like? Our path was very similar to this year’s teams trying to represent Canada in Sochi. We had an Olympic Trials like the Roar of the Rings. All of the best teams in Canada were there. 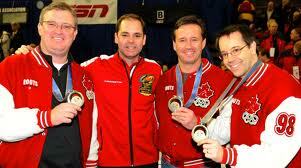 We defeated 2010 Olympic Champion Kevin Martin in the final to earn the right to represent Canada in Nagano. How did you feel at the olympics? I am sure you have special memories from that time… Playing for Team Canada is a great honor, isn’t it? When we went to the Olympics we really didn’t understand what we were going to see. Obviously it was a great honor, and we have many great memories from that event. The opening ceremonies was fantastic, and meeting all of the other athletes from other sports was amazing! It really changed my view on sports, and was a life changing opportunity. Who did you play in the olympics final and what went wrong to make you lose the gold? Which position did you play? We played against Swiss team. During the final, I was very sick. I had viral pneumonia, in fact. Although at the time we did not realize it. I could not take any medication for my sickness either, as you were always afraid of doping violations. I was the skip and I played extremely poorly. It was very upsetting to disappoint my team mates… This still bothers me sometimes, even 15 years later. Losing the Gold medal game is not actually a good memory, as strange as that sounds. But I appreciate what we accomplished more and more as each Olympic Games pass by. I am part of a very small club in Canada, there are very few Olympic medalists! Do you still play curling? On what level? Do you also coach/have you ever coached? I have not played competitively for a few years… I only curl recreationally now, once per week, with friends. But I might have time to have one more run at competing. I am talking about it with some players for next season! But I will have to see if I have the time to commit. It is a full time commitment these days. I currently run a high performance centre in Switzerland and have worked with many teams. I was the official coach for Spain at the European Championship held recently in Norway. I commentate and coach now. If you have kids, do they play curling? Why do you think kids should start curling? Curling is a wonderful sport for kids because it does not really matter how physically active or gifted somebody is, anybody can play! It is also a lifetime sport. There are very few sports that you can continue to play throughout your life. Curling is one of them. It is also a wonderful sport to teach kids about sportsmanship and honesty. Curlers police themselves and there are no officials interfering with the game, except at the very highest level. What do you think curling brought to your life? It’s a game of respect, honesty, teamwork, trust…. Did you learn things from curling that helped you go through your everyday life? Curling has opened up many doors in my life. It has provided me with more fun and enjoyment than anything I have ever done. My favourite part of the sport is that interaction with your team mates and trying to reach a common goal. I would say curling has given me an education on how to treat others, how to believe in yourself, and how to trust your team mates, and how to respect your opponents. These are all things that you can use in your everyday life! Have you ever been to Slovenia before or is this your first visit? This will be my first visit to Slovenia! I am really looking forward to seeing your country! Curling in Slovenia is a very young sport, our national curling association was established in 2010. What would you suggest to all young curlers in our country? How to become better, what would you advise as the former Olympian? I think the most important thing to remember about curling is to understand why you want to play. Reaching the Olympics or making your national team is not what drives our sport. Playing for the love of the game, and meeting new people and making new friends is why all of us in Canada began playing. If you are driven, and talented and find team mates with similar goals, then representing your country is certainly achievable, but it is not the only reason we curl. Play it because it is a great game, with wonderful traditions, and the sport brings people together. Becoming better at curling requires some proper instruction, and then curling is good at rewarding people. I tend to find people get as much out of curling as they put in… but you should never worry about results… Play for the fun of the sport. But, I will go back to my junior days to relate a not so fun moment that changed my view on curling, and life. At the Canadian Junior championships my team was very close to making the playoffs, and on my final stone of the last game, my team mates made a sweeping error that caused us to lose our final match. As a young skip I became very angry with my team, and yelled at my team in the arena, in front of media as well. The next day, in the newspaper, there was a story about this incident, and I felt terrible. I had embarrassed my team mates, and myself, because I did not know how to treat others. I almost lost my 3 best friends because I was more concerned about winning than I was about their feelings. I promised myself after that moment that I would never put winning above friendship. Since then, I have won and lost many many big games in my career. What makes me proudest is that in every major event we lost, I have been able to make sure that my team mates understood that I had their best interests in mind and they always felt like we were friends, and that curling is only a game. Even losing an Olympic final, I was never concerned that my team mates didn’t support me, and they knew that I was always going to support them. This is far more important than winning or losing. Thank you Mike for all your answeres and also for your instructions here in Ljubljana at the Olympic celebration tour.